kt literary » Blog Archive » Happy Book Birthday to Jane Kindred! Happy Book Birthday to Jane Kindred! Ever since J.R. Ward’s Black Dagger Brotherhood series I’ve been an enormous fan of paranormal romance. 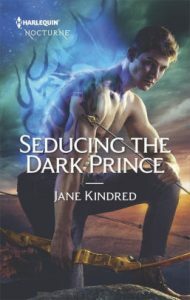 So, it’s with an extra large dose of fangirl excitement that I say congratulations to Jane Kindred on today’s release of SEDUCING THE DARK PRINCE! Lucien Smok is heir to the Smok fortune. He’s also the crown prince of Hell, a legacy he despises. Clairvoyant Theia Dawn tries to convince herself that she’s only interested in Lucien because of his family’s role in the persecution of her ancestor, not because he’s the most beguiling man she’s ever met. The attraction that burns between them might be her downfall. Or it might be his salvation. RT Book Reviews gave WAKING THE SERPENT (Book #1 in the series) its Top Pick! ← Welcome to Angelina M. Lopez!